Jan. 1 – Commence the New Year by Sawing Shingles. Plasant to commence it with good Health for Which we are Gratiful and this being spared we will try and make this year profitable both Spiritualy & Temporaly. Jan. 18 – Hear of the death of Alfred Smith who died of Typhoid fever who was an old School-mate young as well as old are passing away the admonition is be ye also ready. Jan. 22 – Mr. Dickinson died a day or 2 since to be taken to Conneticut to be buried. Jan. 29 – Powells Block burned at Towanda several dwelling houses have not learned the particulars. Burned this morning. Feb. 4 – It is estimated the damage done by the recent fire at Towanda was $200,000, heavily inshured. Feb. 17 –Receive letter from Wesley stating that he has given me a place among his agents and says they have an extraordinary fine baby, a boy. Feb. 19 – Judson Gerould buried also old Mr. Olmstead buried this week. Feb. 20 – Stormy & Snows, Judson Gerould buried today instead of yesterday. Used to like to hear him sing the Base to Boylston. Feb. 25 – Baby born a girl at 12 oclock noon. March 2 – Aunt Hannah McAffee buried at Athens. Father & Mother gone to the funeral. March 7 – Receive notice of being drawn as a Juror ..?.. the Court to be held at Troy convene March 28, this will be the first court that has been held the act passed the Legislature this winter. March 20 – A call from Mr, Mrs. & Miss Solsie (?sp) Risley to see the baby. March 29 – Attending court. Nothing of special interest – the first jury not dismissed yet. Very muddy and stormy. Mar. 30 – Empaneled on Jury. Agree on a verdict for the plaintiff. Then enpaneled on the suit of Wm. S. Dobbins agst. Troy Twp. For a horse killed near --?—mill on July 3d. The rest of the Jurors are discharged. Warm. Mar. 31 – On suit – Set all day & evening. Very tired. Warm and muddy. April 1 – Setting on Jury on Dobbins case. Receive the charge of the Judge at 8 o’clock p.m. Midnight on Jury get the prospect is ?? Shall stay here till morning being equaly divided. April 2 – 2 oclock a.m. we are here yet. Dismissed at 9 am by the Judge as we could not agree at all. Stand in the ??? before walk home from Troy in a heavy rain storm. Mud very deep all the way. Snow going off very fast am very tired. Did not sleep any during the night. ???? a good start for the first Jury. April 5 – Receive letter from S. T. Riggs informing us of the death of Squire Riggs of Canton Pa. Who has been sick for over 3 years. He went prepared for the change. April 16 – C. E. Riggs of East Canton comes to inform Father that he was chosen as one of the Executors to be in the settlement of his Fathers Estate which he accepts. Charley is to stay with us tonight. Apr. 17 – Charley starts for home at about noon. There is a rumor that Fred Ward has the small pox at Burlington Boro he being very sick. Apr. 20 – Turns out that Fred Ward spoken of on 17th has got the measels, a Smart Set of Doctors in Burlington. May 26 – go to Towanda (the 25th) Buy the woman a sweing machine the American or Combination Machine with Button Hole attachment & over seqaming. Bought of Corkins for $70.00. June 11 – Vegetation coming forward very fast the indications are a plentiful suply of vegatables and fruits for which let us thank the Lord. June 12 – D. A. Spencer of Burlington died on the 10th. Buried today at Leona. I understand he was a Christian and one who lived religion. Blessed are the dead who die in the Lord. 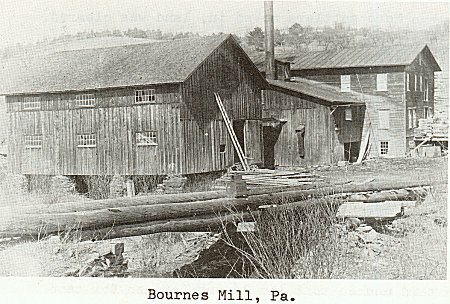 June 23 – Work in Mill. Buy this House & lot. I now live in the lot & house on the north side of Road and farming this and all of a lot Bought of Wm. Campbell except what the pond takes up. Give for all $1600. Calling the land that is stumped $50 per acher that which is not $12.00. June 27 – At Towanda, very warm. Buy furniture to amt of $90.18. Buy 1 note of G. W. Heath of $77.50 against Jas. C. Wood & Horace Heath Date April 25, 1870, ½ due in 6 months ½ in 9 months. July 1, 2 – Quarterly meeting at Old Church, elected Steward and on the Estimating Committee. Heavy showers in the evening. July 15 – Wesley & Hester arrive from North Carolina their baby Walter Lee looks fine they are usualy well. Jul. 16 – Wesley & Hester go over to see his folks in Smithfield, Mr. John Moray landscape photographer of Rome, Bradford Co PA, calls on us and wishes to spend the Sabath with us. Mrs. C. B. Riggs here on an afternoon visit. Jul. 17 – Enjoy the Society of Mr. Moray. Much being of a very sociable turn & a Christian. Wish for more chances like this. Jul. 18 – Mr. Moray takes a dagarotype (?sp) picture of Carrie gets a good picture, buy ½ doz. ?? views he expects to be here again on the 26th. Jul. 21 – go with Mr. Campbells folks to Hatch’s Mountain Huckleberrying. ??? the axel to the wagon broke on the mountain and I had to go off about 5 miles horseback and carrying the axel, get camped & ready for Business at 5 p.m. Pick 10 quarts and sleep on the ground at night. Jul 24 – Thermometer at 96, thunder showers. Rev. P. Sweet (?) buried was known by the name of Uncle Penty Sweet, a Christian Preacher. Jul. 26 – Birthday, 26 years old. In forenoon clear away in back yard, in afternoon visiting with Wesley & Hester also Moray take view of Father House with us all in it. 1. Stereo Group all in Hard Carries Picture Enlarger. Price 2.00 for a 4/4 & frame. Warm and showers. Aug. 13 – Call from Wm. Liscomb of Prov. RI who has just finished his 2d year in college. Aug. 18 – Festival for raising money to buy Grave Stones for the soldiers who died in the late Southern Rebellion held at E. Smithfield. Aug. 25 – Hester, Walter, Ophelia, Isadore & myself going to visiting with Uncle Sam Riggs in Troy township. A good visit. Have a hard cold. Aug. 26 – Uncle Samuel takes Ophelia, Isadore & myself to Minaqua Spring near Canton also receive a deed of L. S. Wright & wife of ?? house & lot nown as the Williams lot containing ¾ of an acher, an old house and barn for $450, give my note payable the 1st of April. Buy it for Isadore’s Father & Mother. Sept. 5 – Work in the mill in the forenoon a little & visit with Rev. Lowell the M. E. Preacher for Burlington circuit for 1870. Also Charlie Riggs & wife here, he was married last Wednesday to a Miss Mary Johnson of East Canton , go over to fathers in the evening. Sept. 13 – In mill in forenoon, in afternoon take Hester & Ophelia to Troy to take the train South going to Elizabeth City, N.C. See them on the train at 10:30 PM get home at 2 AM the 14th. M. J. Long married to Miss Stevens. Buy 1 Trunk (?) Price $15.00, covered with Zinc. Sept. 20 – Old Mr. Larcom buried at the Old Church. Sept. 21 – on rail=road Jay Heath Died. Jay McAffee called in. Sept. 22 – on Rail Road Pay for the Williams House & Lot Burlington Boro. Price $450. Sept. 27 – Finish digging potatoes Francis Wood & wife here visiting this evening. Jay McAffee here for dinner. Sept. 28 – Andrew Sewards boy died of scarlet fever. Oct. 2 – Wesley inexpectedly around here this evening. Stops over Sunday being on Business to NY. They are all well. Captain Usher died funeral the 4th at 1 PM. Oct. 8 – Attend quarterly meeting at West Burlington on Estimating Committee. Preachers salary $600, put on nomination at ??? for Road Commissioner. Election next Tuesday. Receive a letter from North Carolina stating that Hester has the Fever. Oct. 13 – Visit with cousin Ira Wheaton & John Kingsley an acquaintance & look around Owego in forenoon in afternoon go to Uncle James Ingersols. Stay there over night also before leaving Owego see James Nichols an old School Master now living near Owego. Visiting Expense 54 cents. Oct. 14 – Visit with J. Ingersols in morning take dinner at Cousin Ira Wheatons take train for Binghamton at 1:10 PM arrive at Binghamton at 2:00 PM train late so have to stay in Binghamton till 7 PM arrive at Sidney at 9:30 Stay there over night, visiting Expense $3.07. Oct. 15 – Leave Sidney at 7 AM, arrive at Lyons Brook Bridge (best guess of spelling) at 8 AM. Met by Uncle J. C. Parker. Visit there with Theresa (?) & Husband E. Russel (?) in afternoon go down to the Bridge with Russell the Bridge is 800 feet from the ground. Dare not walk over cost $53,000. Visiting Expense $4.40. Oct. 16 – At J. C. Parkers. Pleasant. Finish reading "Five Ackers to Much". Oct. 17 – Visit with J. C. Parkers family in forenoon in after noon go down to Norwich with Uncle Jonas, Aunt Amy & Isadore along have a good time, am taken for a book seller. Norwich is a very fine village, buy 1 Vol. oF Shakespears Works. 1 flock of wild geese flew over. Lookout for tomorrow (?). Oct. 18 – Uncle Jonas takes us over to Uncle Danfords Bournes (?). Aunt Amy along, rains & wind blows very hard, get very cold. Find Uncle Danfords folks well. Isadore catches a very hard cold, don’t like wild geese. Oct. 19 – Uncle Jonas takes us up to Grand Pa Bournes he goes home at 3:30 PM. Call on Stranahans(?) folks. Having threshing machine there I feel rather lonesome as there is no one to visit with of the men folks and the woman folk are all busy cooking. Oct. 20 – Rains all day. Visit with Grand Father & family in forenoon in afternoon Uncle Danford & wife come to take us down to Cousin Sarah Bournes or Millard, where we visit & stay over night – rains hard, Uncle Danford goes hime in the rain. Oct. 21 – Cousin Sarah Millard & Husband take us down to Theresa (Parkers) or Russell where we visit till 1 PM, When we take the cars for Sidney connect for Binghamton at 3:30 PM for Waverly at 7:15 PM, arrive in Waverly at 9:30 PM. Stay over night there. Expenses for the day $6.89 being all for tickets from New Berlin Center to Waverly. Pleasant. Oct. 29 –Mrs. Geo. C. Hill died. Nov. 3 – Go to Troy, buy 1 coal stove for setting room of S. W. Payne. Nov. 5 – Ballards Block Burned last night. Nov. 14 – Old Mr. Calendar Died yesterday. Nov. 15 – Work in Mill in forenoon in afternoon attend a Law=Suit as a witness in case of C. Knapp Plantiff & R. Morley Defendant in regard to shingles the case before J. Travis Burlington. Pleasant. Nov. 17 – Filing up drag=saw. The following Personal is in this weeks "Reporter". Danvers (sp?) Bourne, wife & son of West Burlington will leave for Elizabeth City, North Carolina on Tuesday next to spend the winter. Nov. 18 – Write 1 letter to Hosea & Danford Bourne. Nov. 22 – Take Father, Mother & Lee to Troy to take the cars for Elizabeth City, North Carolina to see Hester and the rest of them. They calculate to stay 4 weeks or so, perhaps all winter. Makes it seem lonesome here now. Rains in the afternoon. They take the train at about 9:55 PM. Saw Uncle Samuel Riggs, all well. Nov. 29 – In afternoon go as a witness to Smithfield Center for G. W. Sanford Plaintiff, Judgement in ?? of Sanford of $40.00 costs. Very pleasant, receive a letter from Father who arrived safe to Baltimore. Nov. 30 – At Towanda get deed recorded dated June 23d 1870. Very Pleasant. Dec. 13 – To to Troy for Our Folks they did not come. Receive a telegraph dispach fro Baltimore Stating they would be in Troy tomorrow at 11 AM. Snowy, very dark, get home at 1 AM the 14th, take supper with S. W. Payne. Dec. 14 – Get Wm. Riggs to go after Our Folks. Our Folks get home at about 3:30 PM. (A lot of this entry is unreadable due to the ink from the other page bleeding through the entries). Dec. 23 – At Waverly, Buy 1 Seth Thomas 8 day calendar clock for $20.75 of D. D. Knapp, take my clock for him to sell. Thinks he can sell it for $10.00. Real Cold. Dec. 25 – Fred Ward & Emma Fitch married. Dec. 26 – Josephus Campbells son & Ida Morley married about this time. James Nichols son also about this time. Dec. 31 – Transferring a/c to new books. The year has been prosperous have cleared $880 odd this year. Our health has been good for which we are thankful. Old Mrs. Blakeslee died.